We ski between 0% edge engagement (skidding out of control) and 100% edge engagement (edge locked). While some consider carving to be an on/off concept, we consider carving to be the last 10-20 percent of that range of edge engagement - the generally accepted pinnacle of on-piste and expert skiing. Carving a shaped ski (with a large sidecut) on a green run is simple and easily accessible to most skiers, as we patiently tip the skis on edge and balance on them while the sidecut makes the ski turn. There is a "nominal radius" given by the shape of each ski. When carving though, we can bend the ski more or less than this "nominal radius", given the skill of the skier, mostly via the amount of tipping. Look again at the first photo and see how much the outside ski has bent in that short radius turn! Also see the difference in bending between the outside and inside skis, indicating that skier is effective in pressuring the outside ski a lot more than the inside ski. Carving steep runs is carving at the expert level. Some athleticism is required to put up with the higher forces. Also, the technique must be very refined, to get early ski engagement. 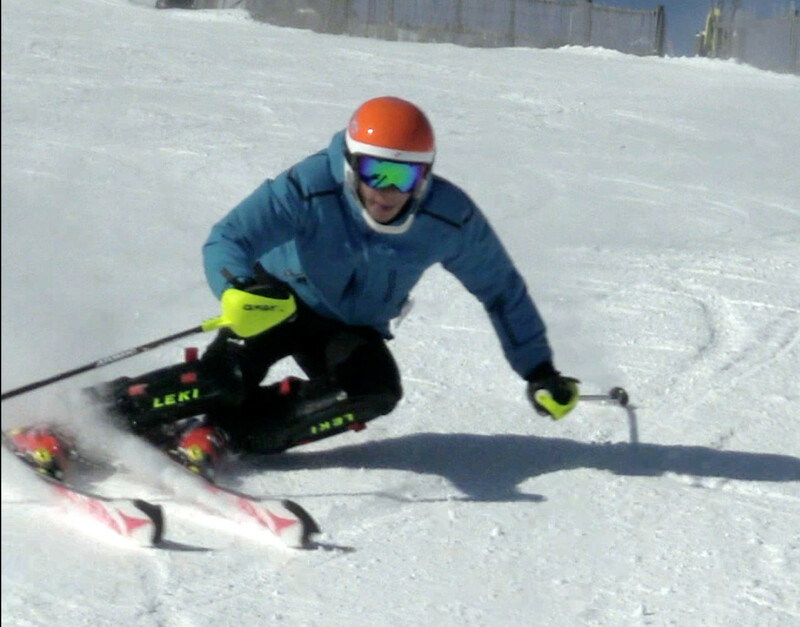 Carving is preferred to skidding by most, as it offers a more stable "platform" and more performance. The same way a car whose tires grip well can turn tighter and with more speed, likewise, a carving ski can provide a lot more turn forces and in the end brings satisfaction to most skiers. At the same time though, many skiers have problems with Speed control in carved turns and resort to pivoting and hockey stops, on steeper terrain. That can be addressed by improving the technique and there are some ideas at the bottom. The edge engagement is also influenced by the snow: the harder the snow, the more definite edge engagement we can have and the more speed we can carry through the same radius turn, while we can carve softer snow, usually with a larger radius turn. The type of ski is important, given the snow conditions. A fatter ski will provide more surface for softer snow, but also, a race ski can cut through the crud and down to the hardpack, when the hardpack is still there. The more sidecut the skis have, the easier it is to carve them. The less rocker the skis have, the more of the sidecut can be used. On ice, the stiffer the ski the better and the sharper the edges, the better. Typical Slalom race skis are tuned at 0.5 degrees base and 4 degrees side bevels. That tune can be too aggressive for a beginner or someone less athletic, however. For recreational skiing, a 1 degree base and 3 degrees side bevels are more common. If you spend time on hard snow, a good sharp tune is essential. Aim to maintain the skis sharp. Given the level of engagement, of the ski's edge with the snow, there are two kinds of carving. Edge-locked carving where the edges are "locked" and dig a thin trench in the snow - this is only possible when the snow is sufficiently hard to hold an edge very well and the skis are tipped on edge sufficiently. Brushed carving or smeared carving when there is no pivoting or skidding, the sidecut is engaged and the tails still follow the tips, but without the edges being quite locked, when either the snow is softer or the skis are tipped on edge just shy of full engagement. The truth is that on softer snow conditions and high-performance carving, the notion of "edge-locked" becomes a little blurry, that's why we call them both carving. The resulting turns are nice round C arcs, with good control and ski performance in both cases and that's what matters more. Awesome experience up here at #cmhheli for the #gopro athlete camp. Fun to rip pow with a bunch of amazing athletes. As you can see, our definition of carving is quite broad. It does not apply only to edge locked turns in hard snow, but includes a lot of balanced turns where the ski works to make the turn and the tail follows the tip on an arc... powder can be "sliced" and "carved" too, as you can easily see in the video above. Carving occurs when tipping the skis on edge at a sufficient angle for the edge to "grab" and hold. That must be complemented with angulation or counterbalancing which will allow higher tipping angles and will put more weight over the outside ski and make it hold an edge even better. Viewed 8199 times ( | Print ) this page.